Layne Pea’s triple in the seventh inning gave the Lady Marshals a walk-off 4-3 win over Graves County in their season-opener Tuesday at home. Preseason 1st Region #1 ranked player Gracey Murt, with the third out of the fourth inning for the Lady Marshals. 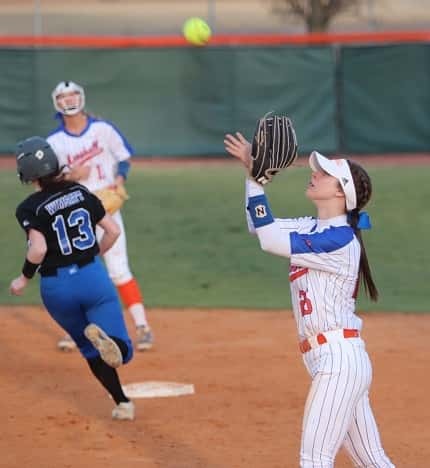 A coaches poll pre-season #14 in the state and #2 in the region Lady Marshals softball team opened the regular season Tuesday at home against Graves County and the 4-3 walk-off win was a sign of exciting things to come for the defending 1st Region Champions. 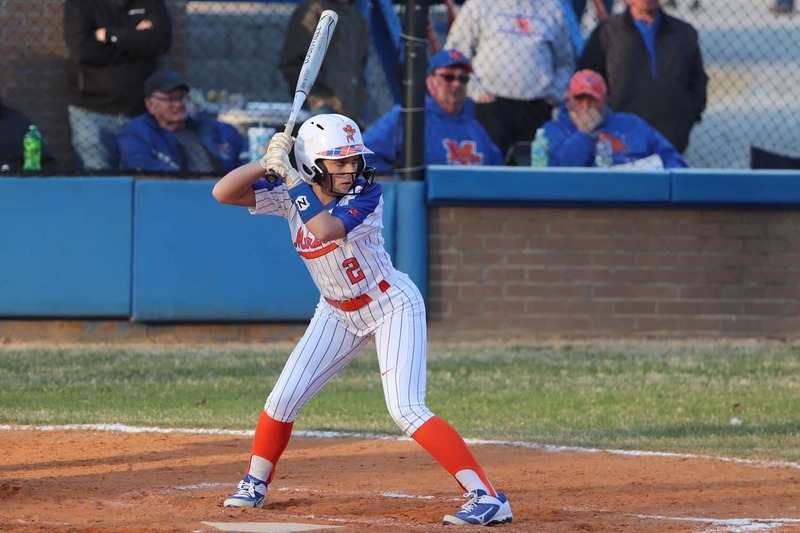 A walk-off triple by sophomore Layne Pea scored three runs in the seventh inning to give the Lady Marshals a season-opening win over the Lady Eagles. After four scoreless innings, the Lady Eagles scored three runs in the top of the fifth inning on a 2-out error and double by Bailey Wilson. The Lady Marshals big seventh inning began on a walk by Presley Jezik, walk by Cayson Conner and 2-out single by Charley Pursley. A walk by Sarenna Tomassi scored Jezik before Pea’s 3-run hit brought in Conner, Pursley and Tomassi for the 4-3 win. Pea led the Marshall County hitters with a single, triple and three RBI’s. The win on the mound went to Gracey Murt who pitched 2.1 innings, allowing no hits and no runs. The Lady Marshals will play three games Friday and Saturday in the McCracken County Early Bird Tournament. Friday they will meet Daviess County at 9:00 p.m., then two games Saturday at noon against Goreville, Ill. and 6:00 p.m. against Pinckneyville, Ill. 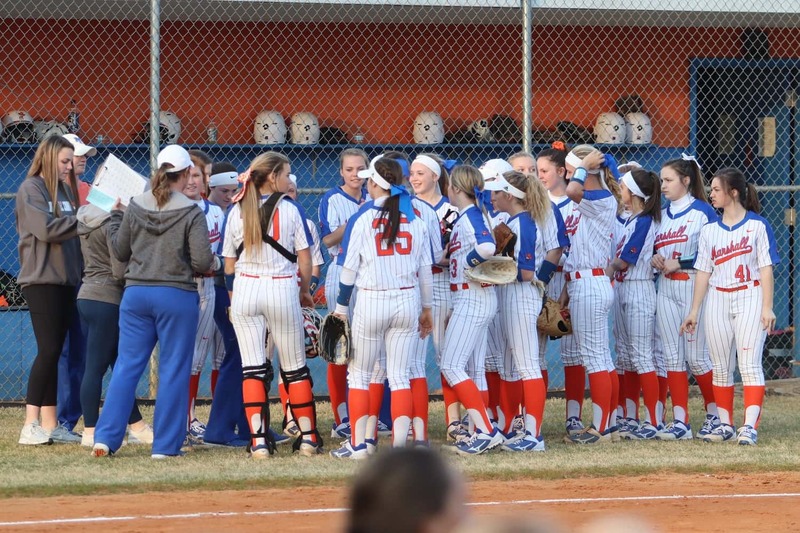 The Lady Marshals gather between innings in their season-opener at home Tuesday against Graves County.